Ideal for a summer, garden, or outdoor wedding, this whimsical creature seems to be a perfect fit for wedding themes. Butterflies adapt to any theme event and they come in all sorts of materials, colors and sizes. Brides love to use them as decorations, but that is not the only use they would have on a wedding. Butterfly wedding favors are diverse. They can be fun, modern and/or functional. Using themed boxes will allow you to have a little DIY touch at your wedding, while choosing a ready-made favor with thank you tags included can save you time when it comes to planning. The decision is yours, but one thing is for sure. 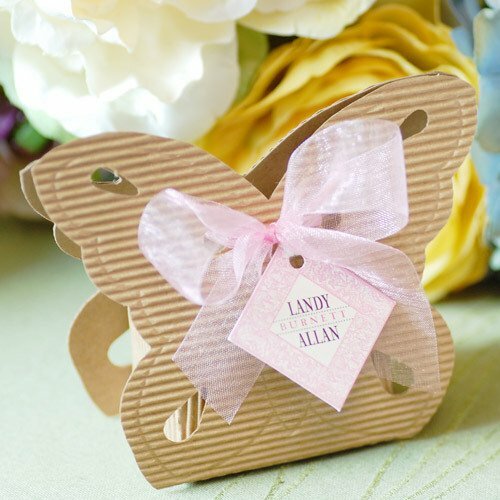 Butterfly wedding favors are beautiful and will be adored by your guests. The butterfly is a symbol of a new beginning. 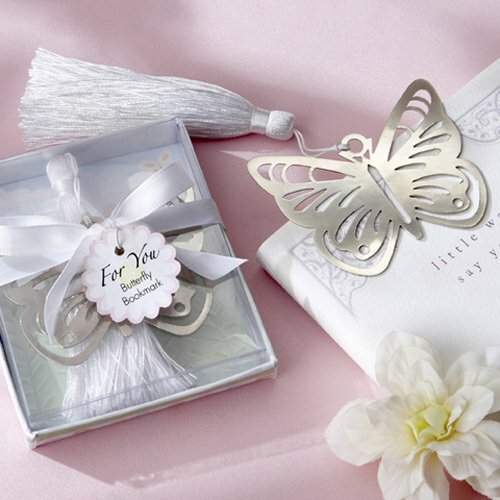 Since your wedding is the start of new life for you and your husband to be, a romantic flurry of butterflies makes these sweet favor boxes just perfect for the celebration. Elegantly created these butterfly wedding favors can also be filled with candies and sweets for that extra appeal that everyone will certainly appreciate and admire. Like a colorful butterfly that gracefully dances in your garden, make your wedding day enchanting and lively. This silver-metal bookmark is a memento from your wedding day that your guests wouldn’t forget. The fanciful wedding favor is artfully presented in a display gift box dotted with flowers in soft shades of pink, blue and lilac with light-green accents. 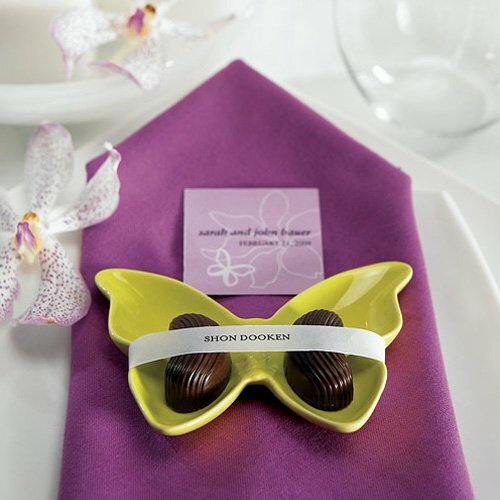 Let your wedding day go beyond extraordinary with this porcelain made butterfly candy dish giveaways. Available in 4 spring hues: deep lavender, white, aqua blue, and apple green. Butterfly items are always ideal for wedding themes that will be celebrated outdoors, like garden and beach events, but also to add a little spark of romance and colors to whimsical and vintage weddings. You can also add them to your bouquet and/or centerpiece. These little creatures will surely over deliver when creating ambiance at your venue. They will also look lovely attacched to your wedding dress or in your flower girls basket or hair piece. Find the favor that will suit your celebration best and let us know your thoughts and ideas in the comments below.